Bill aimed at preventing governor from blocking AG legal opinions requested by lawmakers. (Francisco Kjolseth | The Salt Lake Tribune) House Speaker Greg Hughes, right, speaks with his chief of staff Greg Hartley prior to a caucus meeting on day two of the 2018 legislative session on Tuesday, Jan. 23, 2018. Utah House Republican leaders took a first slap Tuesday at Gov. Gary Herbert — and said more are coming — in retaliation after he prevented them from writing rules for last year’s special congressional election. Lawmakers unveiled HB198, designed to ensure that the governor can never again block the attorney general from providing them legal opinions. 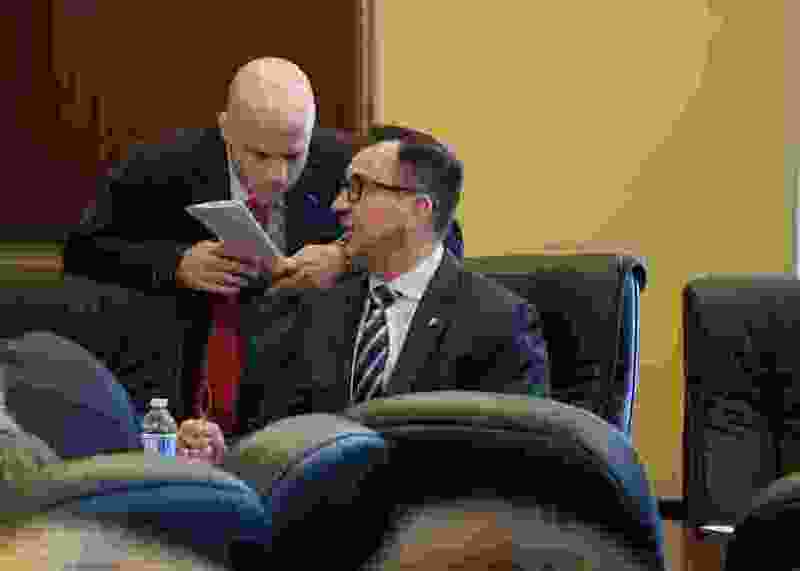 House Speaker Greg Hughes said a constitutional amendment is also coming that could allow the Legislature to call itself into a special session — a power currently reserved exclusively to the governor. Herbert last year refused to call a special session to allow legislators to write rules for the election, and effectively blocked an attorney general’s opinion going to they requested on whether the governor was acting legally. Current law requires the attorney general to provide lawmakers legal opinions upon request, but Herbert effectively blocked this opinion going to the Legislature by claiming its release would violate his attorney-client privilege. He said the AG had general already been working with him about election plans. When a separate part of the AG’s office prepared an opinion for the Legislature, Herbert protested that by advising both sides in a potential lawsuit, the office would violate professional ethics. Attorney General Sean Reyes then refused to release the opinion until Herbert finally waived his attorney-client privilege claim last week. (Ironically, the opinion said Herbert was acting legally in setting rules for the election). The new bill, HB198, outlines procedures that Hughes said should ensure that attorney-client privileges of governors are not harmed. For example, when The Salt Lake Tribune went to the State Records Committee last year seeking the then-confidential opinion, Hughes notes the committee was advised by a lawyer from the attorney general’s office while another assistant attorney general argued against releasing the document. “If that isn’t rife with conflict, I don’t know what is. But if you can handle that, then I think the relationship with the governor should be able to be handled appropriately,” Hughes said. The bill also would require delivery of opinions that lawmakers request within 30 days. If the attorney general declines to do so for any reason, it allows legislators to appeal directly to the Utah Supreme Court for an expedited review of the case. The action comes a day after Hughes warned in his opening speech that part-time lawmakers need to assert their authority more against the full-time governor to maintain a balance of powers. Requests for comment from the offices of Herbert and Reyes were not immediately returned.